All-Pro only charges you for the cleanable carpet. We deduct for beds, tv stands, armoires, couches, sofas, loveseats, etc. The wand will get about 12 inches under all sides of the beds. It will also clean under all end tables, coffee tables, etc. We don't charge extra for general stains, traffic lanes, spots, etc. Since we use the top of the line pre-spray 99.999% of the stains come out with no extra work. Stains that take extra work will cost extra. To figure out how much each stair will cost you to clean measure the length of the stair and multiply that by 1, for instance if your stair is 3' the cost is $3, if it is 4' the cost would be $4, etc. 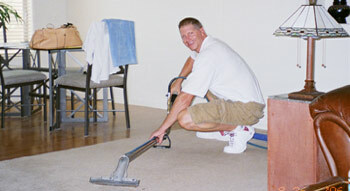 Stair Cleaning Process: We use a special stair cleaning tool designed solely for cleaning stairs. We use the same process to clean stairs as we use on your carpet. Let the pre-spray sit on the carpet so the dirt, dust, traffic lanes, spots, particulate matter, etc. can be extracted. Extract the dirt, spots, traffic lanes, dust, particulate matter, and any other residue using a mixture of 200 degree steam and a cleaning emulsion. Dry pass the carpet to pull out any other residue and moisture, which leaves your carpet as dry as possible so your carpet will dry in 1-4 hours. Neutralize the carpet. Neutralizing the carpet brings the PH down to a neutral level of 7 to bring the carpet back to its original state of a soft, plush carpet that is not stiff. We use booties when neutralizing the carpet so nothing gets transferred onto your clean carpet. We also leave booties for the customers. Booties are put on when you/we get to the edge of your carpet so if we were outside and come back in we might have dirt, dust, etc. on our shoes and when the carpet is damp of course that can transfer. Inspect the carpet with the customer to make sure they are satisfied. We clean ceramic, porcelain and natural tile. A top-of-the-line cleaner is sprayed on the tile and grout. Each grout line can be manually scrubbed. We then use a machine that goes over the tile and grout that has 1,000 PSI and shoots out a mixture of 200 degree steam and neutralizer. this is a self-contained unit so nothing will get on any of your precious belongings. This unit also picks up all the dirt, debris, and gunk that is left over from scrubbing the grout lines, while polishing the tiles and removing any debris that is stuck in the tiles. The end result: your tile and grout looks brand new. Of course not all tile is the same, there is natural and synthetic, so depending on the tile we may use a lower heat. General maintenance cleaning of your tile and grout refers to the same steps as above, the only difference is we don't manually scrub your grout lines. 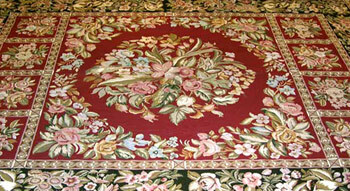 Area rugs can usually be cleaned with the same process we use on your carpet. Oriental rugs always take a different cleaning process than your carpet. Oriental rugs are made out of an assortment of different fibers, such as, silk, wool, wool pile, etc. Some oriental rugs have a backing on them, and some fine oriental rugs just have the fibers woven into a thread backing, which makes them extremely fragile. All oriental rugs have to be cleaned with extreme care so they don't shrink, bleed, etc. Oriental rugs need to be cleaned with a different process than your regular carpet. They need low heat, low pressure, and they should be dried in front of multiple fans, so they will dry as quickly as possible, to ensure no damage to the rug. Some of the more fragile oriental rugs should not be cleaned with a truck mount cleaning unit, they should be cleaned at a wash plant, which All - Pro has. If your oriental rug cannot be cleaned on site we will pick it up, wash it for you, and return it rolled up to protect it. If you are going to store your rug for more than six months we put a sheet of paper over the rug and then roll it up and put it in plastic. This is the proper process that should be used in storing clean oriental rugs. Oriental rugs are very expensive and All - Pro makes sure your rugs are properly cleaned, properly wrapped up, and cared for while they are in our possession.